Do Low Ethical Standards Constitute a Material Risk? The Chartered Institute of Internal Auditors’ study shows that while 91 per cent of the FTSE100 refer in their annual reports to their high standards of business ethics and integrity, only 8 per cent provided a specific metric of their company’s ethical performance. This low level of reporting comes despite the mounting evidence from scandals, such as the mis-selling of financial products, that a company’s poor ethical standards can cost shareholders dearly. Dr Ian Peters, chief executive of the Chartered Institute of Internal Auditors, says: “Recent corporate scandals have provided ample demonstration of the material risk that poor ethical standards can pose to businesses.”…. OK, have you a method for measuring? I’ve been working intros area for years and have one of the few (that I know of) assessments that does just that. I’d love to hear your thoughts on how to measure! There are lots of things to measure. There’s no single measure that sums up how ethical a company is (indeed, the very idea is nonsensical). Some people have tried to sum it up in terms of the “Triple Bottom Line,” but that’s a wildly misleading metaphor. 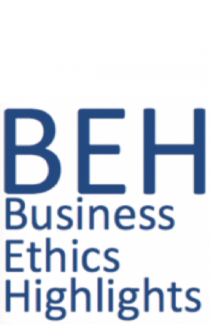 See this critique of the 3BL: http://www.businessethics.ca/3bl/triple_bottom_line_abstract.html Measuring various outcomes, tracking them, and reporting them is good. Trying to sum them up is a mistake.